What do American cowboys think of Barbados? What do Bajans think about Kansas beef? Congratulations to Mark Atkinson who is the new executive chef at Tamarind Cove. 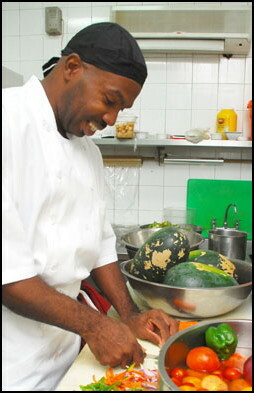 I read about him in Barbados Today’s article Tamarind Cove gets new top chef where we also stole borrowed the above photo. Mark Pickering is in charge of sales for Hotel Food Supplies in Bridgetown and although I don’t know him, I know about his work because I chanced upon a very interesting article in Drovers Cattle Network magazine: Five Minutes with Mark Pickering, hotel food supplies in Barbados. The two Marks probably already know each other. I surmised that after reading a US cattleman’s magazine article about selling beef to Barbados. Thanks to the internet, I now have a better appreciation about how Bajans and their guests like their beef and how that differs from the South American markets and suppliers. My name is Afra Martin Raymond and I am a Chartered Surveyor, being a Fellow of the Royal Institution of Chartered Surveyors. I am Managing Director of Raymond & Pierre Limited – Chartered Valuation Surveyors, Real Estate Agents and Property Consultants. I am also the President of the Joint Consultative Council for the Construction Industry (JCC), an umbrella organisation which represents the interests of Engineers, Surveyors, Architects, Town Planners and Contractors in this Republic. This submission is being made in my personal capacity and does not represent the position of either Raymond & Pierre Limited or the JCC. My work on this vital issue has all been based on the public record and can be seen at www.afraraymond.com. I am willing to give oral evidence before the Commission. The burning question is – When did the Directors and Officers of CL Financial (CLF) know that the group was heading to collapse? When did the Directors and Officers of the failed subsidiaries know?